UNISEX Size: XS-XL - Due to the Unisex sizing, these hoodies do run about a size large!! 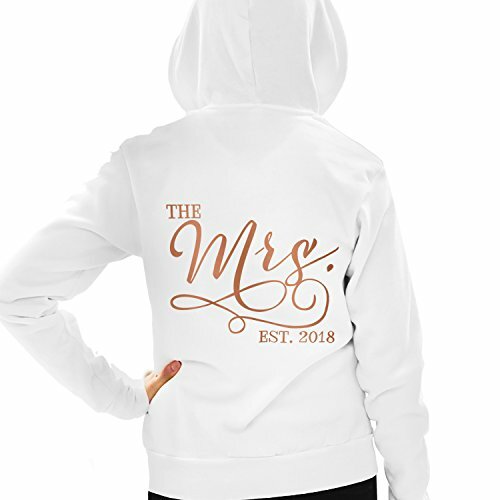 Click "ADD TO CART" now and wow the Bride with this adorable The Mrs. EST 2018 Bride Hoodie. UNISEX SIZING RUNS LARGE: These hooies are unisex sizing and do run about a size large! Please see photo size chart within the listing. EXCLUSIVE METALLIC ROSE GOLD DESIGN! The Bride will love this luxurious and cozy "The Mrs. EST 2018" rose gold Bride hoodie. This hoodie is perfect for wearing to the Bridal Party Spa Day, Bachelorette Party or while getting ready the morning of the Wedding. PREMIUM QUALITY HOODIE! RhinestoneSash prides itself on offering the best Bride Hoodies on the market. We use Bella Brand Zip Up hoodies for comfort, fit and quality. ALL SEASON STYLE! The Mrs. EST. 2018 has a classy look that is perfect for any season. This stunning hoodie will keep the Bride cozy for fall and winter Bachelorette Parties or wear she can wear it while lounging or getting ready for the big day. A GIFT THE BRIDE WON'T FORGET! Click "Add to Cart" now and get this gold rhinestud The Mrs. EST 2018 Bride Hoodie. The Bride-to-Be will love this keepsake gift. If you have any questions about this product by RhinestoneSash, contact us by completing and submitting the form below. If you are looking for a specif part number, please include it with your message.